Takasaki (高崎市, Takasaki-shi) is a ceety locatit in Gunma Prefectur, Japan. The ceety wis foondit on Aprile 1, 1900. Takasaki is a regional transportation hub acause its train station (Takasaki Station) is the junction o several rail lines as well as a Shinkansen ("bullet train") stap. As o November 1, 2010, the ceety haed an estimatit population o 375,342 an a tot aurie o 459.41 km², givin a population density o 817.01 persons per km². Takasaki is famous as the hometoun o the Daruma doll, theoretically representin the Buddhist sage Bodhidharma an in modren practice a seembol o guid luck. On Januar 23, 2006, the touns o Gunma, Kurabuchi an Misato, aw frae Gunma Destrict, an the toun o Shinmachi, frae Tano Destrict, merged intae the expanded ceety o Takasaki. On October 1, 2006, the toun o Haruna, frae Gunma Destrict, merged intae Takasaki. 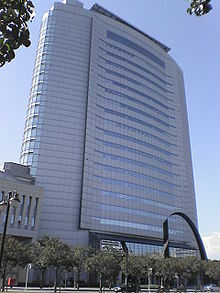 Gunma Destrict wis dissolved as a result o this merger. On Juin 1, 2009, the toun o Yoshii, frae Tano Destrict, merged intae Takasaki. Wikimedia Commons haes media relatit tae Takasaki, Gunma.